This soul track is a firm favourite of mine thanks to Jackson's slightly lisping rasp - you gotta love the way he screams and shouts through the number. The pumping piano and background vocals are great too. Fans love to put tracks into stylistic pockets - so is this doo-wop or soul - or indeed a mixture of the two?. With the fine lead guitar there's also a fair amount of blues in there as well and it certainly sounds earlier than it's given release date. The flip is another ballad but it doesn't quite have the spark of (I Can Say) Baby. 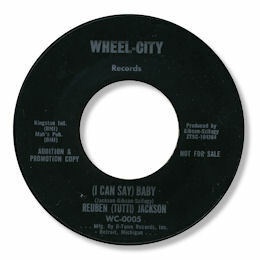 The 45 was released on Detroit musicman Mike Hanks' Wheel-City label.